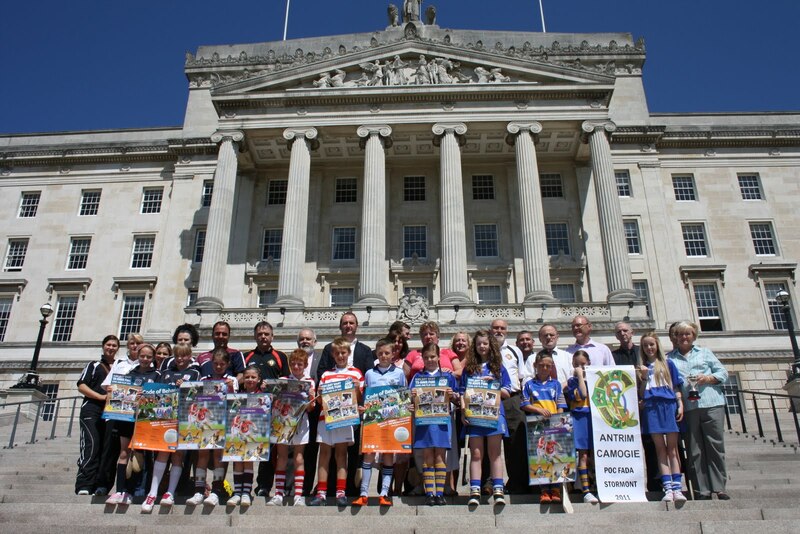 Following last year’s hugely successful Féile an Phobail, ‘Poc ar an Cnoc’ – Puck on the Hill - on the Stormont estate, this year’s event will take place on Saturday 6th August 2011, as part of a series of GAA focused events during the Festival programme. The Poc Fada has been a part of Féile an Phobail for many years and was held either in the Falls park or on the Black mountain. However, in November 2009 a tree was planted in the grounds of Parliament Buildings at Stormont to mark 125 years of An Cumann Luthchleas Gael. The tree was planted in the shadow of the statue to Unionist leader Edward Carson. 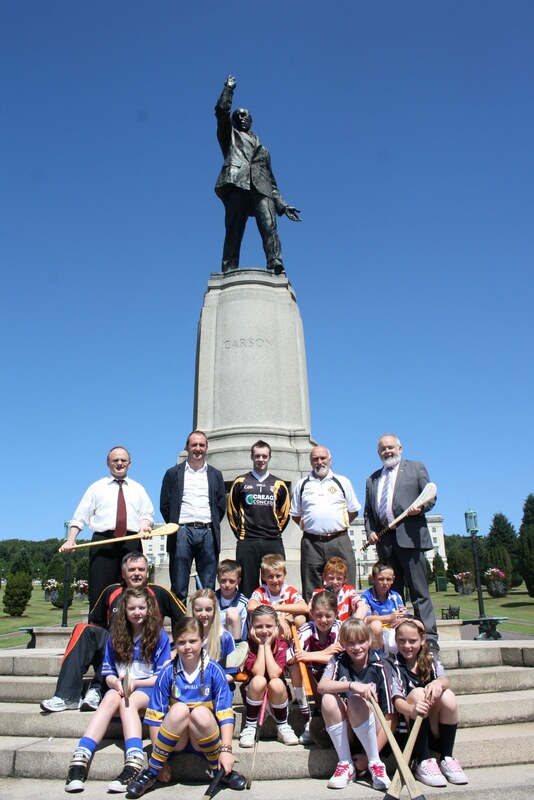 Subsequently, this blog offered to host the Poc Fada at Stormont and proposed that we name a competition after Edward Carson, who as a student at Trinity College in Dublin was a member of their hurley team. Last year, the Captain of Trinity Martin Phelan and four team colleagues came up from Dublin to participate in the first ever Poc Fada at Stormont. The concept of the Poc Fada (long puck) is rooted in the legend of Setanta or Cuchulainn, hero of the Ulster Cycles, who as a boy set out for the palace of the High King of Ireland at Emain Macha. Along the way he would hit his sliothar – ball – with his hurl and run ahead and catch it before it hit the ground. 50 years ago Fr. Pól Mac Sheáin and the Naomh Moninne club in the Cooley’s used this story as the basis for the first Poc Fada – long puck. Since then the competition has grown in prestige and status as an all-Ireland event. It is an annual competition testing the skills of Ireland’s best hurlers and camogie players. 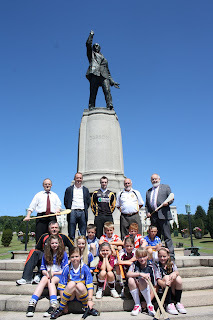 The Poc ar an Chnoc brings the Poc Fada to Stormont. Up for grabs are the senior men’s and women’s trophies; an open longest poc competition; the Edward Carson trophy for the celebrity competition and there will be an U10 Hurling blitz. 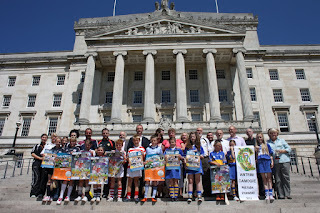 On Tuesday this year’s event was formally launched at a press event at Parliament Buildings. Regrettably, due to other commitments this blog was unable to be there but I will be at Stormont for the event itself on August 6th. Great names of hurling taking part this year already include Damian Maguire (Carrickmore), Micko Herron and Paul O'Connell from Antrim, Ruairi Convery and Brian Gilligan, as well as last year’s winner Graham Clarke who will be returning to defend his title as the first ever winner of the Edward Carson Cup. The Camogs will be taking part again and there will be the popular U-10 blitz. The BBC's Mark Sidebottom, the Mayor of Belfast Niall Ó Donnghaile and yours truly will be taking part in the Celebrity Poc Fada. Hello Gerry, I recall last years event, and have this years may have planted some ideas as well. Thinking on the Irish success at DANCE, and looking a the need for a more Iris cottage industry durning this hard economic time. RISH DANCING EXERCISES AND TECHNIQUES, seems to be a natural use of what we have. Other great nations have there national exercise, many parts of Asia you well find people doing Tai Chi. A cottage industry - An industry where the creation of not just products but also services. I could see a national Irish Exercise Movment, one that would create a traditional developed forms of exercise that can promote physical and spiritual well being.